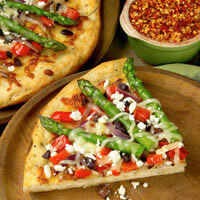 For a quick and tasty vegetarian meal, this pizza will hit the spot. On the dough shell, layer in order, red bell pepper, onion, and olive. Arrange asparagus spears, tips toward edge, in a pinwheel fashion over vegetables. Evenly sprinkle with cheeses. Bake at 500° F degrees until crust and cheese are lightly browned, about 10 minutes.